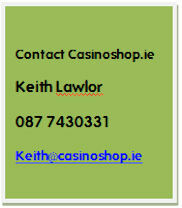 CasinoShop.ie is Ireland's only dedicated casino games supply store. We supply many of Ireland's leading tournaments, event organisers, cardrooms, casinos and of course the general public. Our corporate customers include Ladbrokes, Paddy Power & Boylesports. Our Tournament customers include Big Slick, Vegas Nights, JJP Pokermania, JP Poker, Tipp Poker, Celtic Poker Tour and hundreds of pubs throughout Ireland. We can also advise & supply on casino set up and we have supplied equipment to the following casinos & cardrooms in Ireland - Collossus Club Dublin, Silks Club Dublin, The Jackpot Dublin, Flush Club Kilkenny, Atlantis Carlow, Rumours Ballybunnion, VooDoo Club Dublin, Lighthouse Athlone, Harbour Royale Edenderry and may more. Our products include Poker Chips, Poker Tables, Playing cards, Blackjack Tables, Roulette, casino chips, Clay chips, Ceramic Chips and customised poker chips along with a host of poker accessories. Feel free to browse our many casino and poker products & order online for quick delivery nationwide, Generally the showrooms are open 7 days a week for chips, playing cards, folding tables & table tops, but please call ahead if you need specialist advice / bulk orders.